Volunteers must be a resident of the Republic of Ireland or Northern Ireland. Volunteers will be expected to be available from 9th June through to 17th June 2012 (Two weekends and five intervening days). Work shifts can be up to 8 hours per shift with rest days during the week. 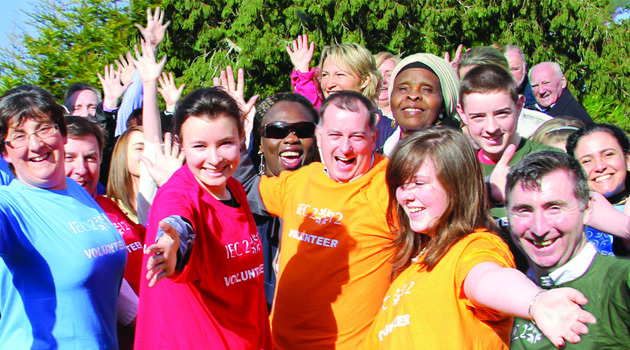 Volunteers will be over 18 years on 1st January 2012. Young people between 16 and 18 years may volunteer as part of a recognized group under adult supervision e.g. youth group or school group. Initially volunteers are required to help plan and organize the programme while others will be needed to recruit, train and manage the volunteer workforce. Volunteers welcome who can assist with the planning and preparations, particularly with experience in event management. Volunteers with excellent English, whose first language is Irish, French, German, Spanish, Italian or Polish. Volunteers with a second language will be particularly welcome. Volunteers will be offered a wide variety of roles to match their skills or experience. Volunteer tasks will include supporting information and welcome centres, transport hubs and event services at the major Congress venues. Training will involve up to 10 contact hours in the period leading up to the Congress and sessions are likely to be held in the Dublin area. All volunteers will participate in general induction training followed by job specific training. Closer to the week of the Congress, there will be familiarization tours for volunteers assigned to designated venues. Every Congress volunteer will have the opportunity to reflect on the spiritual themes of the Congress as part of their induction training and preparations. The Local Planning Committee for the Congress undertakes to train all volunteers for their respective roles as well as provide each volunteer with a uniform and meals while on duty. In return volunteers can expect plenty of hard work with a unique and spiritually uplifting experience as part of a momentous occasion in the history of our Church and community. For those who can only commit their time to volunteer during the Congress then put the dates in the diary now.